The U.S. Department of Homeland Security recently tapped the National Consortium for the Study of Terrorism and Responses to Terrorism (START) to lead a meeting with high ranking officials from the Indian government. R.K.Singh, the Home Secretary for the Ministry of Home Affairs of India, had requested the meeting with the START team at the University of Maryland to complement his delegation's cabinet-level visits with the U.S. Department of Homeland Security, Department of Defense, Department of State and National Counterterrorism Center. The Indian delegation was in the country to take part in the Indo-US Strategic Dialogue chaired by Indian External Affairs Minister Shri S.M. Krishna and U.S. Secretary of State Hillary Clinton. START leadership took the opportunity to discuss establishing research and educational programs at universities in India based on the START model. Gia Harrigan, START Program Manager with the DHS Science and Technology, Office of University Programs, offered an overview of the Center of Excellence Program to Home Secretary Singh and his colleague, Datta Padslgikar, Personnel and Community Affairs Minister of the Embassy of India. Allison Smith, a Program Manager for the DHS Science & Technology Directorate's Human Factors/Behavioral Sciences Division (HFD), followed with an overview of HFD research. START Director Gary LaFree then outlined how India can benefit from replicating the Center of Excellence Program. He discussed how reports such as the 2010 U.S.-India Security Cooperation stress material investments in homeland security and technical cooperation such as intelligence sharing, but not necessarily investments in the human capital of the Indian homeland security community. Teaming with START initially could help provide Indian universities with training, education and research opportunities, while drastically improving the START Consortium's access to expertise in India. LaFree suggested the partnership may be as modest as trading professors and materials to better educate both Indian and American students, or as robust as forming a consortium similar to START in India. "There is a real chance for India to create a research center like ours," he said. "With our experience and extensive international network of researchers, we stand ready to help them in this endeavor." 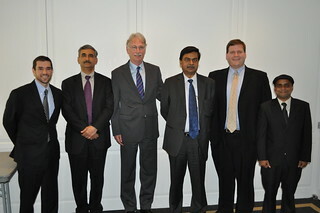 In addition to providing information for the Home Secretary on the genesis of the START Consortium and its current modus operandi, START researchers Brandon Behlendorf and Sumit Kumar engaged the Indian dignitaries in a wide-ranging discussion of current START research and findings pertaining to India and South Asia, evidencing the potential for broader collaboration in the future.